Comet C/2012 K1, also known as comet Pan-STARRS, was captured by NASA's NEOWISE probe as it swept across the sky on May 20, 2014. A NASA probe recently spotted the dazzling Pan-STARRS comet as it hurtled through space against the backdrop of a distant galaxy. Pan-STARRS is a fresh visitor from the outer solar system that lit up night skies last spring as it made one of its first approaches toward the sun. Officially christened comet C/2012 K1, it was discovered a few years ago by the Panoramic Survey Telescope and Rapid Response System, or Pan-STARRS, in Hawaii. Comet Pan-STARRS wandered into the inner solar system thousands and thousands of years after leaving the Oort cloud, a vast shell of icy bodies and debris beyond the orbit of Neptune. The comet made its closest brush with Earth on March 5, 2013, passing about 102 million miles (164 million kilometers) away from the planet and brightening enough to be visible to the naked eye. The dirty ball of ice is still on its way around the sun and was visible to stargazers in the Northern Hemisphere this past June. Comet Pan-STARRS might become visible to Earthlings in the Southern Hemisphere in the fall — at least through a telescope — after it swings around the sun, according to NASA officials. 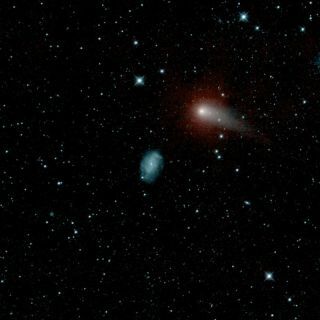 In the NEOWISE infrared images, the comet appears cross the starlit sky, sailing by the faraway spiral galaxy NGC 3726, which lies about 55 million light-years from Earth. The comet has two tails: a bigger one that is easier to see in the new images and likely comprised of gas and smaller particles, and a second more subtle southern tail that may be made up of dispersed grains of dust, according to NASA. The NEOWISE probe scans the cosmos to monitor and characterize potentially hazardous near-Earth objects (or NEOs) like asteroids and comets. The spacecraft was originally called the Wide-field Infrared Survey Explorer, or WISE, but after its primary mission was completed in 2011, it went into hibernation. The spacecraft was reactivated in 2013 and reborn as NEOWISE.